The kitchen is the heart of the home, but it’s also the place that can make or break you on the weight loss front. If you’re on a quest to slim down, do these nine things in your kitchen. Make fruits as accessible as a bag of chips: Wash, cut up, and store fruits such as grapes, melon, kiwi, pineapple, and apples in reusable containers in the fridge so they’re easy to grab. Make sure they’re right up front at eye level so they’re the first thing you see when you open the fridge door. Prepare a big container of salad: Having a salad before dinner is a great way to fill you up so you eat less of the main course, but preparing a salad every night takes so much time that it’s tempting to skip out. Ensure you get a bowl of greens every night by making an enormous bowl of salad at the beginning of the week. You’re sure to eat a salad with dinner if it’s already made — just scoop out a bowl, top with vinaigrette, and enjoy. Have measuring cups and spoons on the counter: Measuring your food will keep portions in check since overestimating serving sizes is a huge reason people don’t lose weight. Seeing measuring spoons and cups on your kitchen counter will be a visual reminder not to forget to use them. Pre-make snack packs: You know what happens when you eat chips or crackers out of the box — you practically end up polishing off the entire package! Take your favorite healthy snacks such as mixed nuts, popcorn, cheese, and fresh fruit, grab some Ziploc baggies, and make some 100-calorie or 150-calorie snack packs you can keep in your cupboard or fridge. Ditch the unhealthy foods: Your hubby and kids might be fans of an occasional can of soda, bowl of cookie dough ice cream, or Hershey’s Kiss, but if those foods are within your reach, you’re bound to crave them. Throw out or give away the junk because if it’s not in your kitchen, you can’t be tempted to eat it. Use smaller-sized plates: When we prepare a plate of food, we feel the need to fill it up completely. If you start out with a smaller-sized salad plate, there’s only so much you can pile on, so you’ll end up consuming fewer calories. Freeze fruits and veggies: Buy larger bags of fruits and veggies at the store and wash, cut, and store them in baggies in the freezer. You’ll not only save money when you buy in bulk, but you’ll also have them on hand to add to your smoothies, yogurt, pasta dishes, soups, and omelets. Double or even triple the recipe: Whether you’re making soup, roasted veggies, quinoa salad, or something else for dinner, don’t just make enough for one meal. 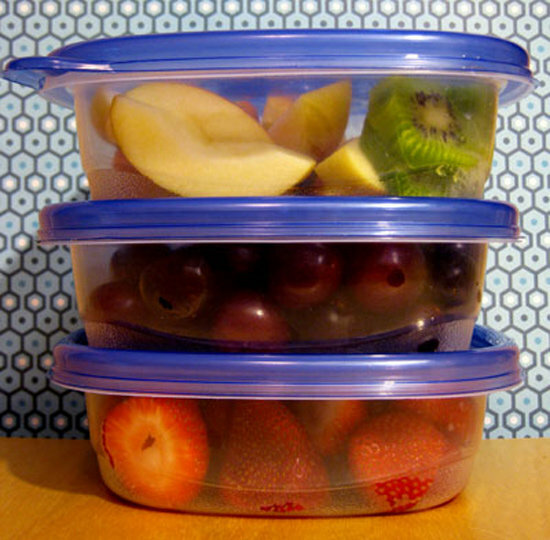 Package the leftovers in containers you can easily grab for the next few days’ meals. If your lunch or dinner is already prepared, you won’t have to resort to unhealthy takeout. Put food away before you sit down to eat: After you’ve cooked up an amazing vegan mac and cheese, serve yourself an appropriate serving size and then wrap it up and put it in the fridge. If you leave it out, you’re more likely to go back for unnecessary seconds or thirds. Out of sight means off your hips.